Brazilians Semente were found during the summer of 1976 in Rio De Janeiro by brothers Alexandre Kosinski (guitar, violin) and Pedro Kosinski (bass, keyboards, vocals) along with drummer Mario Carvalho and bassist/guitarist/keyboardist Sérgio Benchimol.With no money at all they reputedly rehearsed at the house of the Kosinski brothers in Barra da Tijuca, using a pedal and an amplifier as a bass and percussions, borrowed by Flamengo artists, to perform the drum parts.A few years later they had managed to obtain their own equipment and by 1979 they had recorded a few songs on tape.When Pedro Kosinski left the same year, he was replaced for a short time by Ricardo Bottecchia, but the band dissolved around 1980 due to professional commitments.About two decades later Benchimol gathered the old line-up to re-record their old material with the help of Pedro's wife Marcia on female vocals.The dream came true in 1999, when Semente relased a self-produced, self-titled CD, also available from the band's website as a free download. Semente played a mystic, slightly folkish Psych Rock with progressive extensions, based on slow tempos and intense but a bit fragmented instrumental moments with some hypnotic vocals supporting the music.Their sound was a combination of light, jamming electric guitars and a tight, narcotic rhythm section, featuring some smooth PINK FLOYD/STEVE HILLAGE-like passages.Still there is a fair amount of calm keyboard parts in the album with the organ leading the way, then comes these local-sounding parts with the nice use of flute, but the most important addition comes when Benchimol picks up his sax, then the whole band becomes pretty energetic and the combo offers complex instrumental ideas in the vein of VAN DER GRAAF GENERATOR.You can see why this band was inspired by these groups, their delivery, although noted for its good production, contains some strong 70's aesthetics, the use analog keyboards, the echoes of old Psychedelic Rock groups and the desire to build their material on a light spacey mood, all do have certain links with Rock Music's best era.The tracks are lengthy but so are some of the solo parts of Semente, leading to a bit overstretched instrumental themes with little diversity over the running time.The execution though is pretty satisfying, the Portuguese vocals are perfectly suitable to the style performed and the richer moments are definitely efficient. 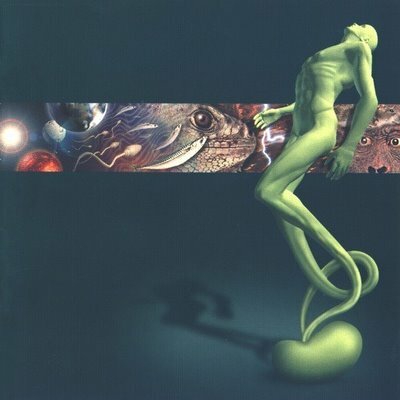 In 2001 the band released the live album ''Ao vivo'' and at this point the story of Semente comes to an end with all members returning to their daytime jobs and daily routine.Sérgio Benchimol though has produced a number of solo albums with flexible influences, all linked to artistic and even Prog Rock music. Slow-motion Brazilian Psych/Prog, filled with cool sax and flute parts and carerful keyboard orientations, characterized though by the omnipresent electric guitars and psychedelic bass/drum rhythms.Recommended.